The occurrence of emerging pollutants like pharmaceuticals and related compounds in the aquatic and terrestrial environments is of increasing concern. Ciprofloxacin is one of the pharmaceuticals which is active against a wide range of bacteria. The main objective of this research is to develop a simple method for the extraction and determination of ciprofloxacin residues in environmental water samples. A salting-out assisted liquid–liquid extraction (SALLE) method for the determination of ciprofloxacin in water samples by high-performance liquid chromatography with diode array detector (HPLC–DAD) was developed. The calibration curve was linear over the range of 0.1–100 μg/L with coefficient of determination (r2) of 0.9976. The limits of detection (LOD) and quantification (LOQ) of the method were 0.075 and 0.25 µg/L, respectively. The reproducibility in terms of relative standard deviation (% RSD) was less than 10%. The applicability of the developed method was investigated by analyzing tap water, bottled mineral water and waste water and demonstrated satisfactory recoveries in the ranges of 86.4–120%. The method offered a number of features including wide linear range, good recovery, short analysis time, simple operation process and environmental friendly. The developed method can be utilized as an attractive alternative for the determination of ciprofloxacin residues in environmental water matrices. Pharmaceuticals are molecules designed to produce a therapeutic effect both in human and veterinary. Pharmaceuticals contain active ingredients that have been designed to have pharmacological effects and confer significant benefits to society. However, their continuous large-scale consumption and the subsequent release in the environment can be proven fatal for animals and plants. Pharmaceuticals are considered a class of emerging contaminants that have raised great concern in the last few years [1, 2, 3]. They are continuously being released in the environment mainly due to insufficient removal (70–80%) in wastewater treatment plants (WWTPs), whereas the remaining 20–30% is due to other sources of pollution, such as livestock and industrial wastes, hospital effluents and disposal of unused or expired pharmaceuticals [4, 5]. They are present in various water bodies because up to 95% of the dose can be excreted or discharged directly into domestic wastewater [6, 7]. Research has shown that these compounds are not effectively removed during conventional wastewater treatment; therefore they are released into the surface waters, as mixtures of parent compounds, their metabolites and transformation by-products. Some pharmaceuticals can persist in the environment and, either via the food chain or via drinking water, can make their way back to humans, while the properties and fate of metabolites and transformation products are still largely unknown [8, 9]. The occurrence of pharmaceutically active compounds in the environmental water has been confirmed with the concentrations usually range at the μg/L to ng/L range in surface waters . In recent years, pharmaceuticals have received growing attention from environmental and health agencies all over the world owing to recent studies showing the occurrence of pharmaceutical compounds in the environment, especially in water bodies and have become one of the emerging water pollutants . The occurrence of pharmaceuticals in wastewater and environmental samples is highly dependent on local diseases, treatment habits and market profiles, thus, the pollution profile can vary significantly between different countries . Pharmaceuticals in water can have potentially toxic effects on the environment and human . However, pharmaceuticals are not included in the models for the assessment of water quality index [14, 15]. Antibiotics are among the pharmaceuticals most commonly used in health care systems but the prescription is mostly made on an empirical basis by prescribing broad-spectrum antibiotics [16, 17]. 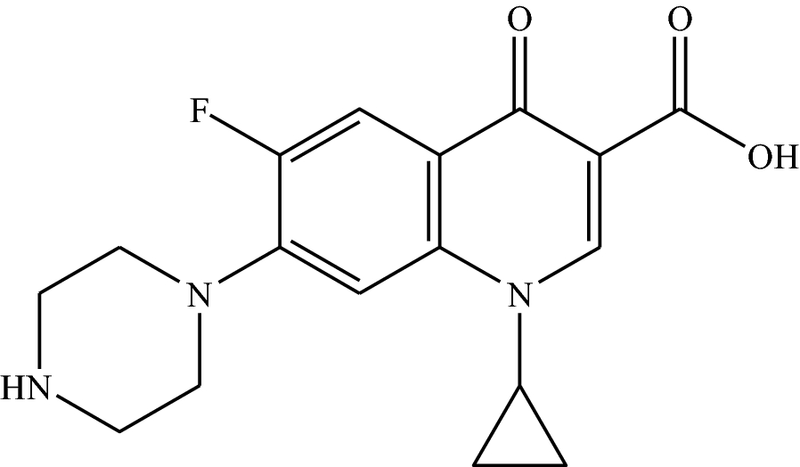 Ciprofloxacin [1-cyclopropyl-6-fluoro-1,4-dihydro-4-oxo-7-(1-piperazinyl)-3-quinolone carboxylic acid] (Fig. 1) is a synthetic fluoroquinolone derivative which has demonstrated broad-spectrum activity against many pathogenic gram-positive bacteria such as Streptococcus, Pneumoniae and Enterococcus faecalis, and gram-negative bacteria including Salmonella, Shigella, Campylobacter, Neisseria and Pseudomonas. The bacterial action of ciprofloxacin results from interference with enzyme DNA gyrase which is needed for the synthesis of bacterial DNA [18, 19]. It is widely used in the treatment of urinary tract infections, lower respiratory tract infections, bacterial diarrhea, skin and soft tissue infections, bone and joint infections, gonorrhea, and in surgical prophylaxis. Physicians prescribe ciprofloxacin as a first choice of drug . Ciprofloxacin have an amino group (piperazinyl) in the heterocyclic ring and have two dissociation constants. The reported pKa values of ciprofloxacin are 5.76 (acidic) and 8.68 (basic). They are in their zwitterion form in neutral condition and in cationic form in acidic condition [21, 22]. It is very important to have information on the physical and chemical properties of an analyte (e.g., log Kow, pKa) because that may help to determine whether a compound is likely to concentrate in some specific conditions. Log Kow is an indicator of the lipophilicity of the compound, high log Kow is typical for hydrophobic compounds, whereas a low Kow signifies a compound soluble in water. Most pharmaceuticals have acidic and/or basic functionalities; their ionization rate depends on acidic dissociation constants (i.e. pKa values) and is controlled by solution pH (e.g., pKa1 and pKa2 values for certain fluoroquinolones (i.e. ciprofloxacin) are in the ranges 5.7 to 6.3 for carboxylic group and 7.6 to 8.3 for protonated amino group, respectively) . Determination of pharmaceuticals in different water samples can be performed by various chromatographic techniques, including HPLC–UV , HPLC–DAD [25, 26], LC–MS , LC–MS/MS [28, 29] and GC–MS [30, 31]. HPLC is the most common method used for separation and determination of these compounds because most pharmaceuticals are non-volatile . As the residue of pharmaceutical compounds is usually present at very low concentrations in the environmental water, a sample preparation and pre-concentration step are necessary before analysis [23, 32]. Several procedures have been reported for the pre-concentration of pharmaceuticals from water matrices including solid phase extraction (SPE) [27, 33], liquid–liquid extraction (LLE) , QuEChERS method , magnetic solid phase extraction (MSPE) , hollow fiber liquid phase microextraction  and salting-out assisted liquid–liquid extraction for non-steroid anti-inflammatory drugs (NSAIDs) . Each of these methods has its own advantages and disadvantages. Salting-out assisted liquid–liquid extraction  is based on the phase separation of water–miscible organic solvents from the aqueous solutions in the presence of high concentration of salts. It uses water–miscible organic solvents which generally have low toxicity as the extractants, and the use of salts causes almost no pollution to the environment [19, 39]. Having such benefits, salting out assisted liquid–liquid extraction was selected to extract ciprofloxacin from water sample in the present study. The objective of this study was the optimization of analytical parameters for the extraction by SALLE and determination of common antibiotic ciprofloxacin residues in water samples using HPLC–DAD. All the chemicals used in this study were of analytical grade. 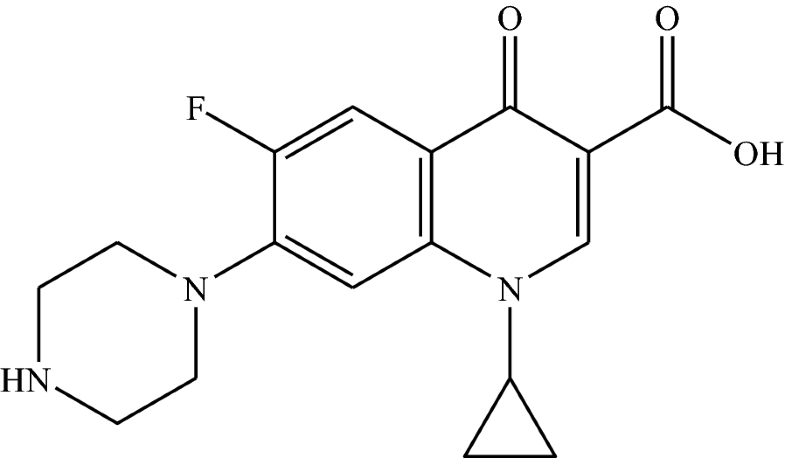 Standard ciprofloxacin (99%) was obtained from Addis Pharmaceutical Factory PLC (Ethiopia). HPLC grade methanol (Carlo Erba, Rodano, Italy, HPLC grade, > 99.9%), acetonitrile (Sigma-Aldrich, for HPLC, UV and GC, > 99%), acetic acid (Fisher Chemical UK, 99%), ammonium solution (Fisher Chemical UK, 35%), ethyl acetate (Fine Chem Industries, Mumbai, > 99%), formic acid (Sigma-Aldrich, 85%) and ethanol (Fisher Scientific, UK, 99.9%) were used as received. The different salts used were magnesium sulfate (Fine Chem Industries, Mumbai, 70%), sodium chloride (Sigma-Aldrich, 99.5%), ammonium acetate (BDH Chemical Ltd, England, 96%), and sodium acetate anhydrous (BDH Chemical Ltd, England, 96%). Distilled water was used throughout the study. The HPLC system used in the present study was Agilent 1200 Series equipped with Quaternary Pump, Agilent 1200 Series Vacuum Degasser, Agilent 1200 Series Autosampler and Agilent 1200 Series Diode Array Detector Purchased from Agilent Technologies (Hewlett-Packard Strasse Waldbronn, Germany). Chromatographic separation of the compounds was performed on a C18 analytical column (Techsphere 5ODS, 25 cm × 4.6 mm ID; HPLC Technology, Macclesfield, Cheshire, UK). Data acquisition and processing were accomplished with LC Chemstation software (Agilent Technologies). Adwa pH meter (AD1020 pH/mV/ISE/Temperature, Hungary) was used for the determination of the sample pH and A 800 model centrifuge, China, was used to speed up the phase separation. An electronic balance (Adam Equipment Company, UK) was utilized for weighing the different chemicals involved in the experiments. For the measurement of total dissolved solids (TDS) and electrical conductivity, conductivity meter (Postfach 24 80, Germany) was used. Stock solutions of the ciprofloxacin (20 µg/mL) were prepared in distilled water and stored at 4 °C. Spiked distilled water samples were prepared with the analyte at a known concentration (0.1 µg/mL) to study the extraction performance of salting-out assisted liquid–liquid extraction under different conditions. The sample solution (10 mL) was first spiked with a predetermined volume of the standard solution containing the target analyte and quantitatively transferred to each of the 15 mL screw-capped polyethylene test tubes. Then, 5 mL acetonitrile and 4 g MgSO4 were added. Thereafter, the solution was shaken gently for 6 min to ensure complete dissolution of the salt. This was followed by centrifugation of the solution at 4000 rpm for 5 min which resulted in phase separation. The upper organic phase was carefully withdrawn using micro-syringe and the extract was dried under a steady stream of nitrogen gas and reconstituted using distilled water (1 mL) and then transferred to a vial for subsequent injection to the HPLC–DAD system. The schematic flow chart of the extraction procedure is given in Scheme 1. The developed SALLE method combined with HPLC–DAD was validated utilizing matrix-matched calibration curves, linearity, detection limits and intra- and inter-day precisions. The intra-day repeatability was studied for three replicate experiments and the inter-day repeatability was investigated for three consecutive days at optimized extraction condition for an aqueous sample containing 0.1 µg/mL of ciprofloxacin. 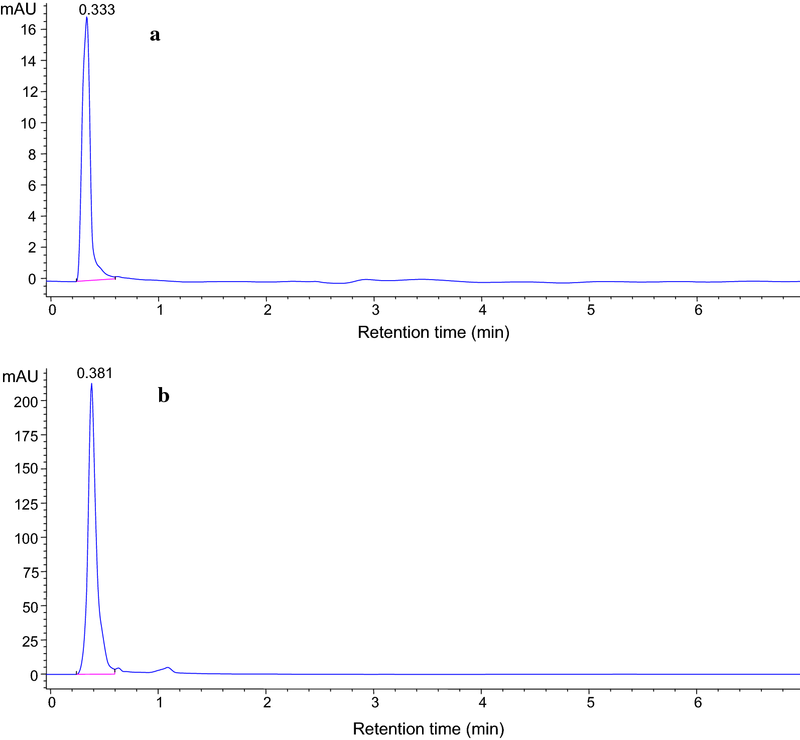 The linearity was investigated over a concentration range by plotting corresponding HPLC peak areas versus concentrations of studied analyte. Limits of detection (LOD) and quantification (LOQ) were calculated at signal to noise ratio of 3 and 10 times, respectively. Environmental water samples (1 L each) were collected from wastewater samples from two pharmaceutical industries (PIW1 and PIW2), hospital wastewater (HWW), Addis Ababa Sewerage Treatment Plant (AASTP) and river water (RW) in 1 L amber colored glass bottles. Immediately after the arrival of the sample to the laboratory some physic-chemical parameters like electrical conductivity, pH, total dissolved solids (TDS) and salinity of the water samples were examined. Before the experiment, all the water samples were filtered through 0.45 µm filter paper and stored in amber colored bottles at 4 °C in the refrigerator. The optimum mobile phase composition utilized throughout the chromatographic analysis was 0.1% formic acid in water/acetonitrile (70:30, v/v) at a flow rate of 0.9 mL/min in isocratic mode. The column temperature was maintained at 35 °C and the detector was adjusted at the optimum detection wavelength of 277 nm with a bandwidth of 4 nm. An aliquot of 20 μL of the extracted sample was injected into the HPLC column automatically and eluted for 10 min run time and 2 min post-time. Finally, the peak area was utilized as an instrumental response and the analysis was obtained under the aforementioned chromatographic conditions. All the measurements were done in triplicate. The data were analyzed using statistical software (SPSS Version 21). The results are reported as mean ± SD. Differences were considered significant when p < 0.05. The graphical expression was done using Microsoft excel 7. Five organic solvents namely methanol, acetone, acetonitrile, diethyl ether, and ethyl acetate were examined as extraction solvent. The extraction capabilities of these solvents are depicted in (Table 1). It can be seen that under the same extraction condition, acetonitrile provided the best results with the only peak of the selected analyte. The other solvents used did not show any peak in the retention time of the target analyte (ciprofloxacin) in the chromatogram. The first two solvents, i.e. methanol and acetone are completely miscible with water and they were unable to produce phase separation at all after centrifugation. Hence they were not taken as candidates for further comparison. However, the last two, diethyl ether and ethyl acetate produced the phase separation before the addition of salt. Hence additional comparison steps were carried out for these three solvents which gave clear phase separation. From the three solvents, only acetonitrile showed the peak of the analyte in the chromatogram and it was selected as an extraction solvent. As it was reported , acetonitrile is miscible with water in any proportion at room temperature, lowering the temperature or addition of salt significantly reduced the mutual miscibility, even resulting in phase separation of acetonitrile from the aqueous phase. The other two solvents diethyl ether and ethyl acetate did not showed any peak in the chromatogram presumably because they could not extract the analyte due to their lower polarity than acetonitrile. After acetonitrile was selected as the extraction solvent, its volume was optimized using the same extraction condition. The volume of 5, 10 and 15 mL of acetonitrile was used for the selection of the optimum volume for the analyte extraction from 10 mL of sample. As shown in (Fig. 2), maximum peak area was obtained when the volume was 5 mL. When the volume of acetonitrile was below 5 mL, the phase separation was not easy and it was very difficult to take the upper organic phase separately. Similarly, at higher volumes of acetonitrile, above 5 mL, the volumes of the upper organic phase get increased but decreasing the analyte enrichment by dilution and hence further higher volumes were not examined. The pH value is important as it affects the ionization status as well as the solubility of the analytes [41, 42]. For efficient extraction of ionizable and relatively polar compounds, pH of the sample solution plays a decisive role. 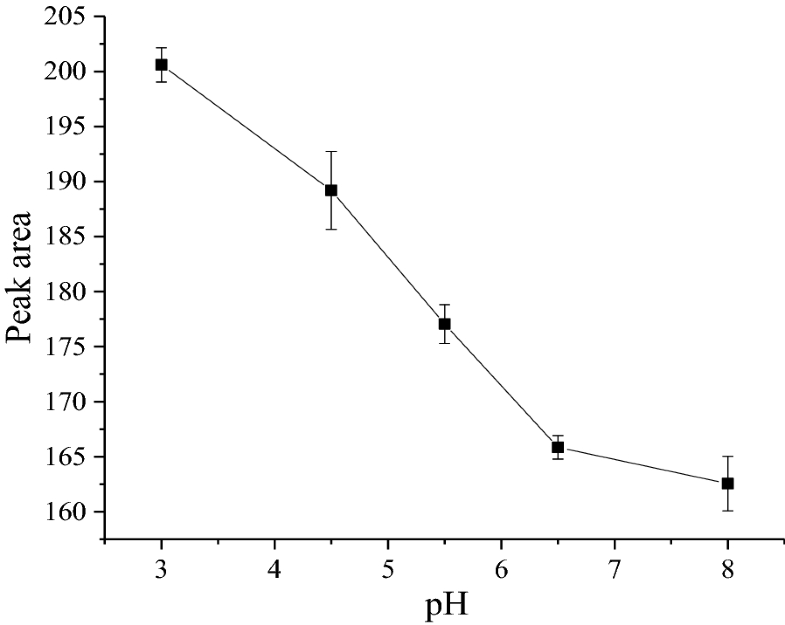 The sample solution pH should be lower than the pKa of the analytes to obtain the target analytes in their unionized forms so that they have a higher tendency to partition into the organic phase . The effect of varying pH values of the sample solution on the extraction efficiency was studied in the range of 3.0–8.0. The results are depicted in (Fig. 3), which demonstrated that the extraction efficiency decreased by increasing the pH up to about 8.0. 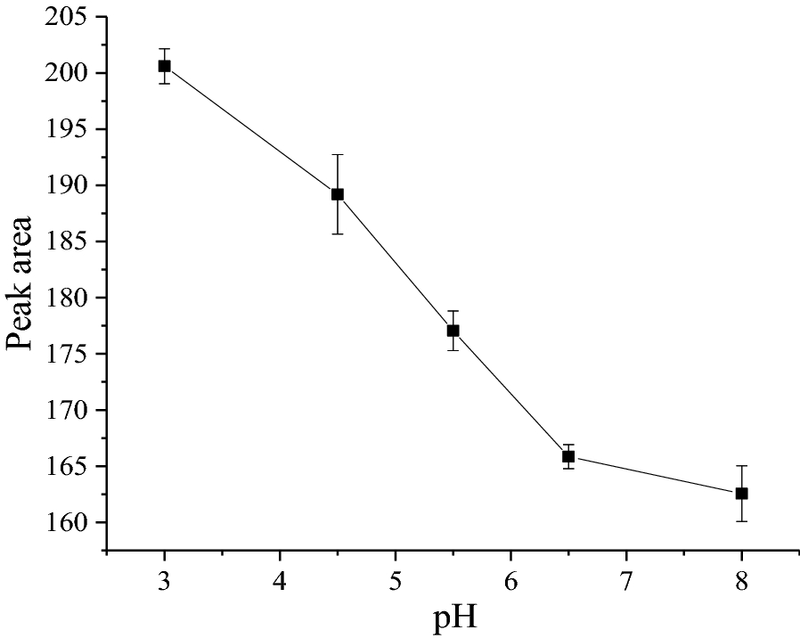 Therefore, the pH value of 3.0 was selected for the extraction of ciprofloxacin. When a water sample is acidified to a pH that is less than the pKa value of target compounds, the acids are non-ionized which leads to their adsorption through the reversed–phase interactions. At acidic conditions they are in cationic form, which is important for their retention during the extraction. At basic conditions, the anionic species of both acidic and piperazinylic quinolones are less retained in comparison to cationic, zwitterionic and neutral species [43, 44]. 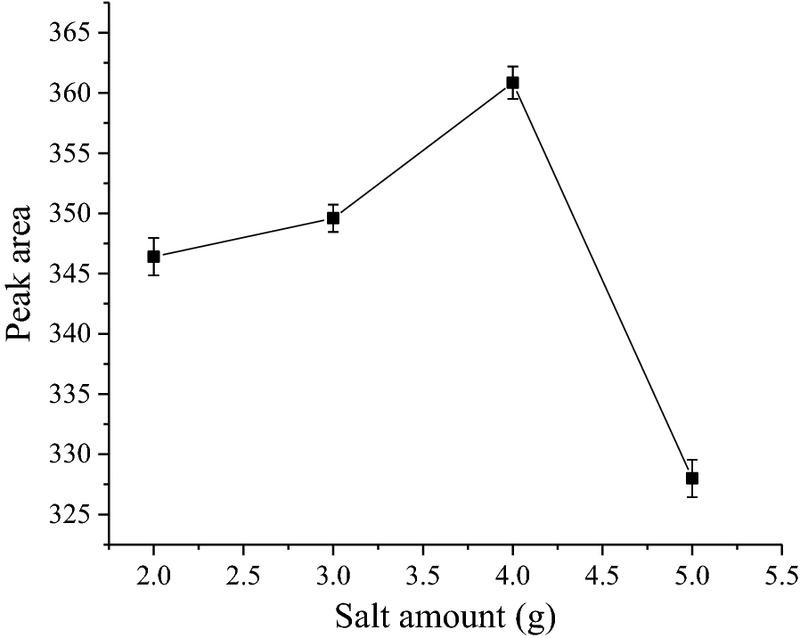 Different salts and different salt concentrations cause different degrees of phase separation. The effect of ionic strength was extensively evaluated in traditional liquid–liquid extraction. The addition of a salt is often used to decrease the solubility of hydrophilic compounds in the aqueous phase through a salting-out effect and consequently increase the partition of analytes into the organic phase . In order to obtain phase separation and the optimum extraction efficiency, several salts with different combinations (MgSO4, MgSO4 with NaCl, MgSO4 with NH4OAC, and MgSO4 with NaOAC) were examined (Fig. 4). 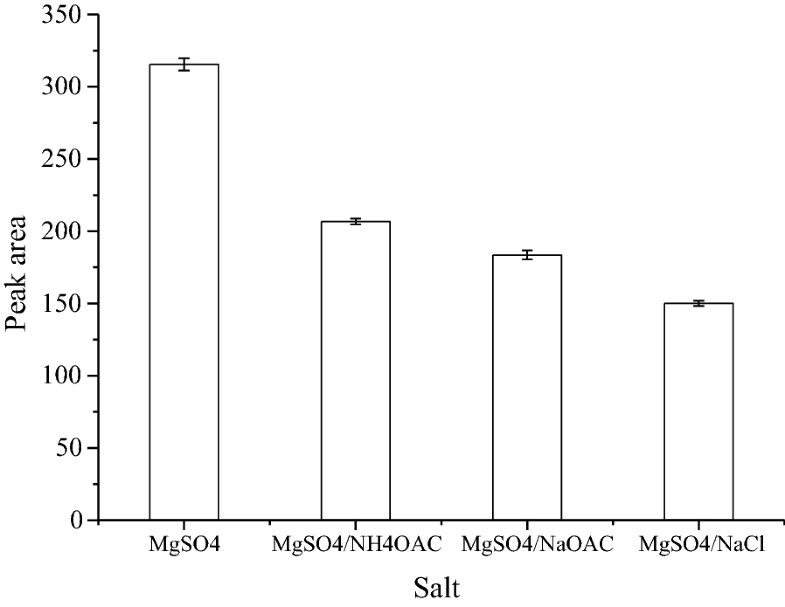 The results demonstrated that MgSO4 separately provided higher extraction efficiency than the other salts. This may be due to its high ionic strength per unit concentration in the aqueous phase compared to its combination with other salts. It should be pointed out that any strong Lewis base could have interaction with magnesium and impact on the extraction efficiency because magnesium is a strong Lewis acid . Therefore, MgSO4 was selected for further study. 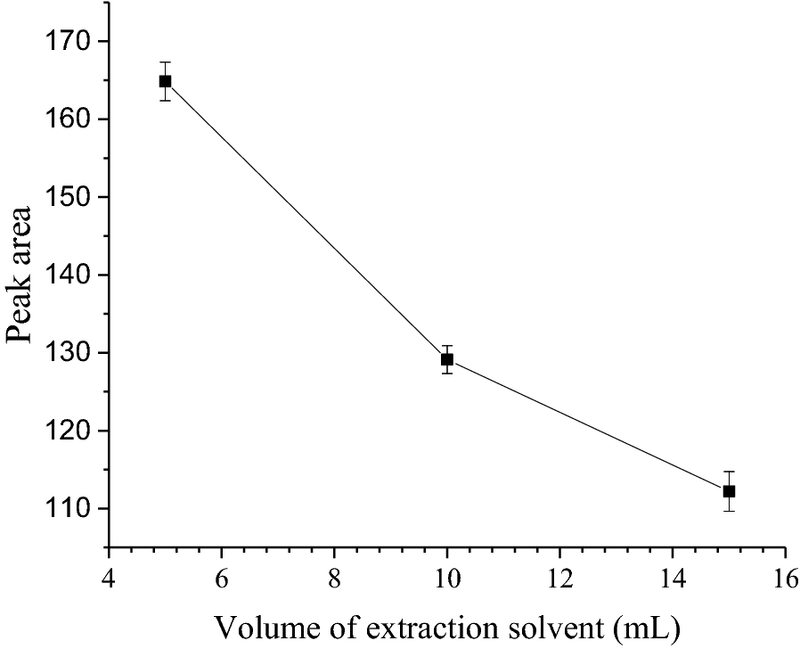 Meanwhile, the effect of the amount of MgSO4 on the extraction efficiency was investigated, varied amounts of MgSO4 from 2.0 to 5.0 g (changed every 1.0 g) were added to 15 mL mixed solution (contained 10 mL treated sample solution and 5 mL acetonitrile). It is evident from (Fig. 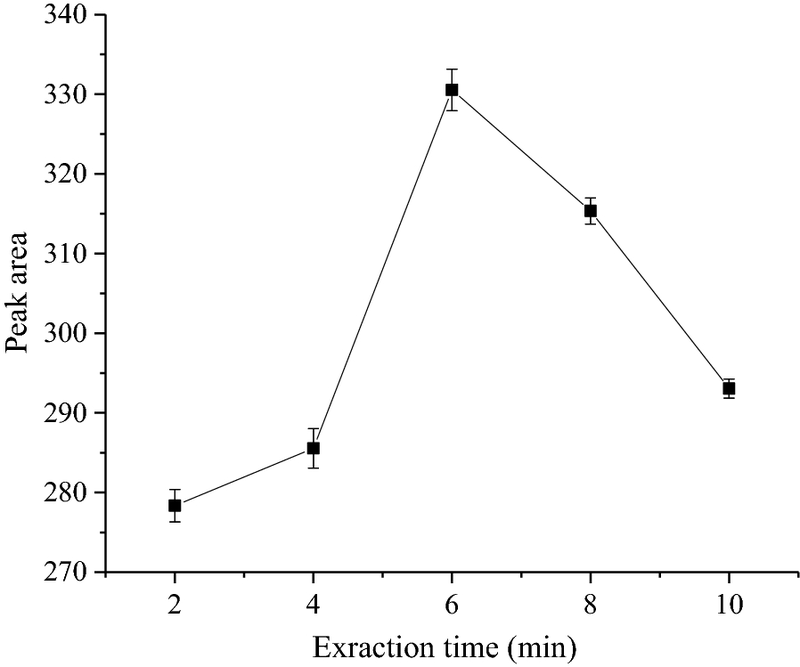 5) that the optimum amount of MgSO4 for the extraction of analysts and the phase separation was considered to be 4 g at room temperature in a 10 mL sample solution. At lower amount of MgSO4 the extraction of analyte was not complete while at much higher amount (5 g or more) of MgSO4 might resulted to reverse the extraction of analyte due to increase in polarity of the aqueous phase. Centrifugation speed is one of the most important parameters in the sample preparation steps and also plays a key role in the separation of the phases and thus results in a clear solution. In order to obtain the highest signal, the speed was varied from 2000 to 4000 rpm. The corresponding experimental results revealed that the peak areas were increasing with the centrifuge speed, up to 4000 rpm (Fig. 6). 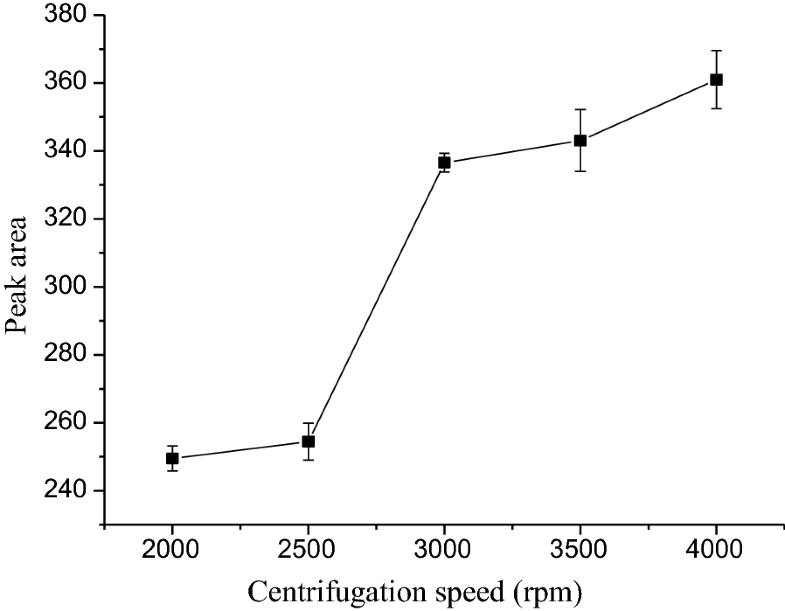 Hence 4000 rpm were taken as optimum centrifugation speed. Further higher centrifugation speeds were not examined. Mass transfer is a time-dependent process and is also factors in most of the extraction procedures. In the present study, the effect of extraction time on the extraction of analyte was investigated over the range of 2–10 min. The experimental results revealed that 6 min extraction time was found to be optimum. This may be attributed to the very fast mass transfer taking place initially but before the establishment of the equilibrium state, which was achieved later, around 6 min (Fig. 7). Therefore, extraction time of 6 min was found to be the optimum time and used throughout this study. Longer extraction time resulted in decrease of analyte extraction. This might be due to higher miscibility of the two phases at longer extraction (contact) time. Physicochemical parameters are evaluated to determine the degree of contaminants in the water that can affect the water quality and consequently the human health . These are evaluated usually based on scientifically assessed acceptable levels of toxicity to either humans or aquatic organisms . Selected physicochemical parameters of the environmental water samples collected for the determination of ciprofloxacin antibiotic were determined and are presented in Table 2. From all the water samples analyzed, river water was found to have the highest value in conductivity, TDS and salinity than the rest of the water samples. Hospital wastewater showed basic pH and the others are comparably neutral. The analytical characteristics of the proposed method were determined under the optimal conditions. The analyte (ciprofloxacin) showed a single characteristic peak at retention time of about 0.333 min. The calibration curves were established by analyzing the extract of the spiked water sample with the analyte at five different concentration levels. Each level was extracted in triplicate and each extract was analyzed. The calibration curve was obtained by plotting the peak areas versus concentration of the analyte. The results obtained revealed that the calibration curve was linear in the concentration range 0.1–100 µg/L. The coefficients of determination (R2) for the analyte was higher than 0.9976, indicating good linearity over the studied concentrations range. The limits of detection (LOD) and quantification (LOQ) were determined as the minimum analyte concentration yielding three and ten times the signal to noise (S/N) ratio, respectively. Thus, LOD was 0.075 µg/L and the LOQ was 0.25 µg/L. Precision was demonstrated by determining the inter- and intra-day relative standard deviation (% RSD) of the analysis with 0.1 µg/mL spiked water sample. The intra-day precision was evaluated by analyzing the spiked samples in the same day and the RSD was found to be 1.7% while inter-day precision was performed for 3 days and the RSD obtained was 6.9% which are in the acceptable range. This further indicates that the short retention time did not make an issue in day to day sample analysis. In order to investigate the applicability of the proposed SALLE method, recovery experiments were carried out on four kinds of water samples of different origin spiked with different concentration of ciprofloxacin. The recovery results as shown in Table 3 ranged from 86.4 to 120%. Ciprofloxacin was not detected in tap water, bottled mineral water, and hospital wastewater. It was detected only in the waste water from Addis Ababa Sewage Treatment Plant (AASTP). This could be due to either the water samples analyzed other than wastewater from AASTP, were free from the residues of target pharmaceutical or contained concentrations below the detection limits. The obtained ciprofloxacin concentration in the wastewater sample from sewerage treatment plant was 0.83 µg/mL. This might be because the sewerage treatment plant collects wastes from many toilets from the city. Like many studies, result reveals that most pharmaceuticals found in the wastewater as parent compound and/or its metabolites via excretion, mainly in urine (55–80%) and to a lesser extent in feces (4–30%) [47, 48]. Typical chromatograms of the non-spiked wastewater and spiked wastewater (0.1 µg/mL) samples from Addis Ababa Sewage Treatment Plant using the optimized SALLE–HPLC technique are shown in Fig. 8. The important analytical parameters of the proposed SALLE–HPLC–DAD method for the determination of ciprofloxacin antibiotic residue were compared to some of the previously reported methods and the data are summarized in Table 4. The proposed method has good and comparable analytical results compared with other methods for extraction and determination of ciprofloxacin in different matrices. Based on the experimental findings the proposed technique has wider linear range and lower limit of detection and quantification compared to others work [49, 50]. In addition, the present method has better values of correlation coefficient (R2) and better recovery than the most of the reported methods [35, 51]. However, the present method has higher detection limit and less sensitive than the reported methods based on mass spectrometry detector. But the present method has advantage of easy of operation in contrast to other HPLC/MS methods. Therefore, the proposed SALLE–HPLC–DAD can be considered as one of the preferred alternative having a promising future for selective and quantitative extraction of pharmaceutical residue contaminating various environmental water systems. A SALLE method coupled with HPLC–DAD was developed and successfully utilized for the determination of ciprofloxacin residue in environmental water. The method offered a number of features including wide linear range, high recovery, and short analysis time, simple operation process and environmentally friendly. Based on the present findings SALLE, coupled with a water–miscible extraction solvent, acetonitrile, and MgSO4 as the salting-out agent, could be taken as a significantly promising extraction and pre-concentration method for trace analysis of water-soluble pharmaceutical (ciprofloxacin) residues which are difficult to be extracted with non-polar organic solvents from various environmental water samples. The method has advantages of simplicity, easy operation and short analysis time with consumption of low volume of the less hazardous organic solvent, acetonitrile. Therefore, the developed method can be utilized as an attractive alternative for the determination of antibiotic ciprofloxacin in environmental water matrices. FZ and BSC designed the study; TG and BT performed the experiments; TG and BT collected the data and drafted the manuscript; FZ and BSC interpreted the data; BSC edited the manuscript. All authors read and approved the final manuscript. 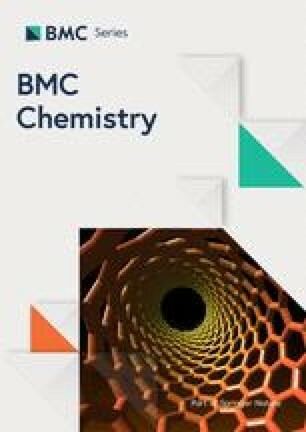 The authors are grateful to the Chemistry Department, Addis Ababa University, Ethiopia for providing laboratory facilities.